IC 1396 is a large emission nebula in Cepheus. The main circular portion of the nebula spans about 3 degrees in diameter, which approximates the size of 6 full moons end to end! Unfortunately, its large size is offset by its relatively low brightness — the many features seen here are only visible in long exposures (preferably through emission line filters). The bright star near the center probably provides the radiation that allows the nebula to “glow”. Herschel’s Garnet Star (aka Mu Cephei), a red supergiant at least 1000X larger than the sun (and perhaps the largest star with naked eye visibility), is, alas, just out of view at the bottom of the image. 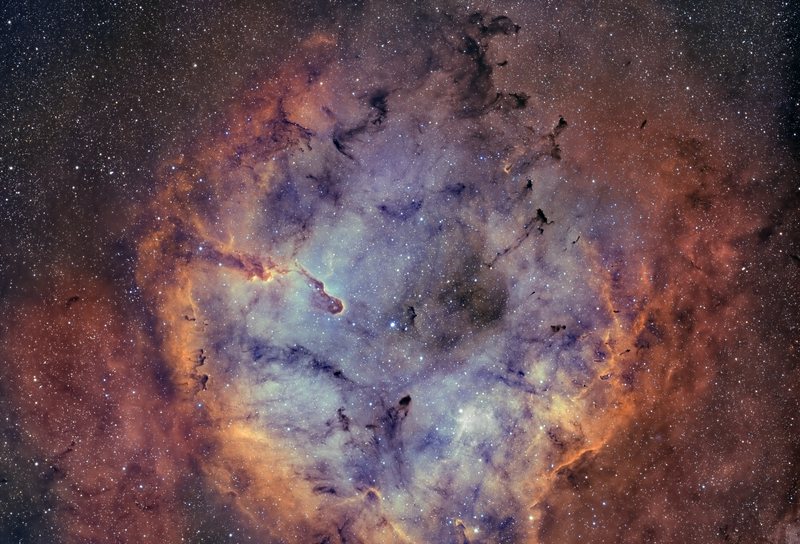 However, at 9:30 is the interesting feature known as the “Elephant’s Trunk” nebula. All data was acquired at MYHY Observatory in the Philadelphia suburbs during the fall months of 2018. I used an SBIG STL 11k with Astrodon 3 nm Ha and OIII filters, Takahashi FSQ 106, and Paramount ME. All subexposures were 30 minutes for a total exposure of about 36 hours. Processing was accomplished using: Maxim for data reduction; PixInsight for image alignment, integration, and initial data stretches; Photoshop (using a modified bicolor technique to synthesize the green channel from the red (Ha) and blue (OIII) channels.